One of the problems in our daily lives is that many of us rush through the day, with no time for anything … and when we have time to get a bite to eat, we gobble it down. Portion control & Overeating prevention. When you eat slowly it is definitely hard to overeat. 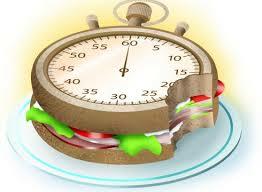 Slow eating little by little decreases the desire to eat, so you can stop eating before your plate is empty. It is suggested that it takes about 20 minutes for your stomach to produce the hormones telling your brain that you are full. Weight control benefits. Slowly eating habit reduces the risk of becoming overweight. Recently, researchers have found a strong positive correlation between higher eating speed and obesity. It can’t hurt you. Slow eating doesn’t have any negative effects on your health, but can bring you a number of benefits without extra costs. Taste and enjoy your food. When you eat slowly, you end up tasting your food more. You will experience more of the flavors, textures and smells of the food you eat. At the same time this may become a small step to a more healthy diet. If you won’t like what you eat when you eat it slowly, probably the next time you will choose something of a better quality. Digestion. Eating slowly and chewing properly improves your digestion. It is well known that digestion begins in the mouth. The more we chew our foods, the easier it is to digest them. Heartburn (gastroesophageal reflux). Eating food quickly may cause a type of indigestion called gastrpesophageal reflux. Less stress. Eating slowly, and paying attention to our eating, can be a great form of mindfulness exercise. Be in the moment, rather than rushing through a meal thinking about what you need to do next. When you eat, you should eat. This kind of mindfulness, will lead to a less stressful life, and long-term happiness. Give it a try.